2012 weather allowed us to make the style of Syrah we are really aiming to make. Nearly black and opaque, but no new wood is used. We ramped up the stem inclusion this year to 65% to cut some of the primary fruit and allow the aromatics of lavender, pepper and bacon fat to shine through, especially with aging. The wine was aged 17 months in one year and older French Oak barrels. Thomas' tasting note... The 2012 Riverain Syrah takes everything we loved about the 2011 and brings them into clearer focus. At this early stage, the 2011 was a little backwards, reticent. The 2012 has a much more open expression. With dark fruit, classic Syrah characteristics of meat and game and just a hint of stems to add mid-palate complexity, this is the wine we had envisioned when signing on to this Bennett Valley legend. A healthy decant will be required to fully enjoy this wine in its youth. 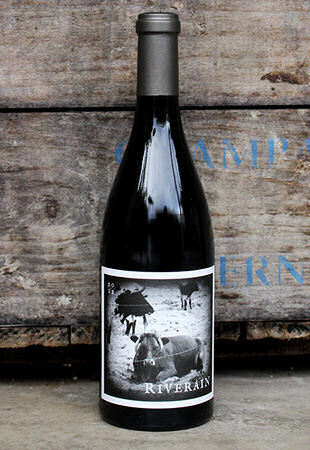 "A Côte Rôtie lookalike (and that's not easy to pull off in California) is the 2012 Syrah Cardiac Hill Bennett Valley. It smells like there's some co-fermented Viognier in it, given the lychee nut and honeysuckle nuances in the deep cassis and black raspberry and black cherry-scented aromatics. Ripe, medium to full-bodied, with great acid, some black olive notes, and a heady, full-bodied finish, this is complex stuff to drink over the next decade. -- 94 points"